Recent release “The Tabernacle in the Wilderness: Its Implications and Applications for Modern-Day Believer Priests” from Page Publishing author Willie J. Murphy, Jr. is a well-researched book that presents the immediate and ultimate purpose of the Tabernacle, delving into the Jewish system of worship and the Old Testament realities before Jesus Christ came into the world. Willie J. Murphy, Jr., the founding and senior pastor of the Pool of Bethesda Christian Center in Hollywood, Florida, has completed his new book “The Tabernacle in the Wilderness: Its Implications and Applications for Modern-Day Believer Priests”: an educational work that tackles the Tabernacle and looks closely at its furniture, priesthood, symbols, and observances to reveal God’s glory and enhance one’s worship to him. Author Murphy stresses the significance of still studying the Tabernacle even for the present worshippers under the new covenant: "As we consider the importance of the Tabernacle, it is almost impossible to view it without regard to the types and shadows that are presented. It is important for us to note that even though there is a difference in worshipping God at the Tabernacle under the old covenant and worshipping God under the new covenant, the principles are identical in that what the Old Testament priesthood did physically, we, as New Testament modern-day believer priests, are to do spiritually. This is what is meant by the sentence, "The actuality of the old depicts the spirituality of the new."" Published by New York City-based Page Publishing, Willie J. Murphy, Jr.’s eloquent writing gives a fresh perspective of worship and elaborates the principles of the Tabernacle to have a better understanding of God. Murphy also points out that the Old Testament practices and principles lead to the reconciliation of God and people through Jesus Christ. 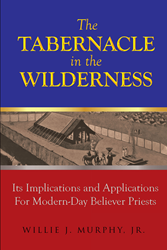 Readers who wish to experience this engaging work can purchase “The Tabernacle in the Wilderness: Its Implications and Applications for Modern-Day Believer Priests” at bookstores everywhere, or online at the Apple iTunes store, Amazon, Google Play, Kobo or Barnes and Noble.